Crispy loves creamy and vice versa. Every time I make a puree of vegetables, I seek a counterpoint, whether snipped herbs or toasted breadcrumbs or something closer to the base, such as a roasted version of the same vegetable. Think of applesauce with roasted apple cubes and fresh apple slices, mashed rutabaga with roasted rutabaga chips, and so on. With a giant head of cauliflower from our organic CSA, I wanted to use it all since there’s another in the wings. I separated the flowerets from the base, and the base’s stem from the leaves. The stem of the cauliflower, the dense white part between the flowerets and the green leaves, is often discarded, but its most tender parts, like broccoli stems, are quite edible. Because cauliflower can be pretty bland and watery, I typically steam it lightly before pureeing it with a little heavy cream or whole milk. Adding a potato instead of, or in addition to, the milk also keeps a puree creamy. 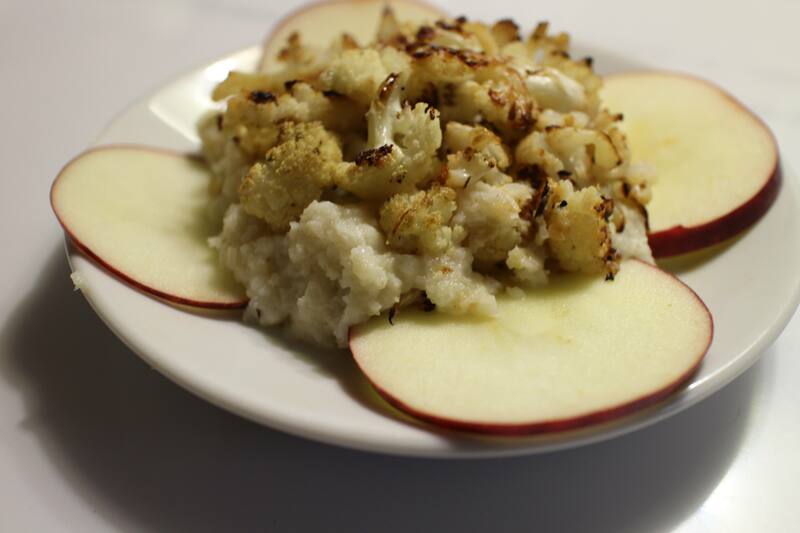 Here, I roasted the apples and onions instead of sautéing them since I was already using a pan for roasting the cauliflower topping. This was a great combination. Sauteed or pan-roasted breadcrumbs would have been an over-the-top addition but welcome to achieve that crispy counterpoint. Instead, I served this with fresh apple slices, useful for scooping. Pretty good for a snappy fall supper.